For visitor's information, go to Burntcoat.Head.Park on Facebook. The lighthouse at Burntcoat Head was detroyed by the Coast Guard in 1972, when it was replaced by skeleton mast. Erosion had washed away much of teh land on which the building stood. Many citizens of Burntcoat Head wished to see the lighthouse standing once again, overlooking the highest tides in the world! In 1992, East Hants Tourism Association submitted a proposal to the Central Nova Tourist Association for development of the Fundy Shore thorough Ecotourism. This was seen as an opportunity to obtain core funding to rebuild the light. 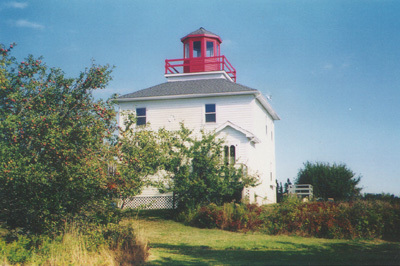 The citizens of Burntcoat Head continued to urge the re-building of the light and in August, 1993, the ownership of the property was transferred from the Queen to the Municipality of the District of East Hants. On April 29, 1994, Robert Carruthers, MLA for East Hants announced that the Burntcoat Head Project would receive $37,000.00 through the Co-operation Agreement for Tourism Development. Fundraising in this small community raised more than $5000.00 to add to the grant! In July 1994, plans for the 1913 light were obtained from the Coast Guard, and by November the replica of the second Burntcoat Head light was nearly complete. The Nova Scotia Youth Conservation Corps built footbridges and developed nature trails, trees have been planted, and picnic tables installed to make a park at the site. The replica lighthouse contains an interpretive centre about the Fundy tides, old lighthouses, and the history of the area. There is a magnificent panoramic view of the Minas Basin from site. You can watch the ebb and flow of the tides, and see the island where the first light was built, and dozens of rock formations. Visitors have access to the shoreline, but are warned about the tides! The completion of this project is a magnificent achievement by a small community! A lighthouse was built on the head in 1858, and lit in 1859. This first light at Burntcoat was a square wooden tower 50 feet high attached to the end of the wooden lightkeeper's dwelling. Flat wick-type kerosene lamps showed a white fixed light 75 feet above high-water, visible for 13 miles. The five oil lamps, with reflectors, had to be cleaned daily. A narrow neck of land connected Burntcoat Head to the mainland. Over time, the tides of Fundy eroded this until the Head could only be reached with much difficulty involving a climb up the bank by ladder! Consequently, in 1913, the first light was torn down and some of the timbers used in the construction of a new lighthouse on the mainland. This second light was a white, square, wooden dwelling, with a red octagonal iron lantern rising from the roof. The lighthouse was 39 feet high from base to vane and the white fixed light was visible from all points of approach for 14 miles. The light was a 4th order lens, i.e. 250mm in focal length. The lighting was a catoptric system: the lamp was backed by a parabolic reflector. The lightsource was a petroleum vapour Argand burner: oil was vaporized at 37 pounds pressure and burned under an incandescent silk mantle. In 1950, the light was electrified. Photo - © Kathy Brown, Building Plans for the Second Burntcoat Head Lighthouse. 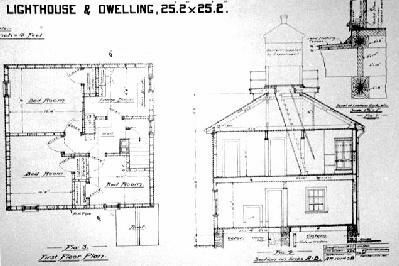 These plans were obtained from the Department of Fisheries and used to build the lighthouse replica. This second lighthouse was replaced by a 22 foot skeleton mast, and and the building burned by the Department of Transport in 1972. Later, the light on the skeleton mast was discontinued, so there is no navigation marker for the head. 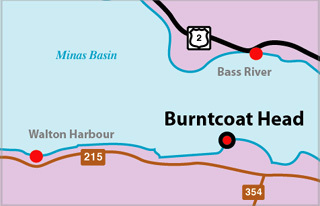 Burntcoat Head lies on the south side of the entrance to Cobequid Bay. A seemingly minor incident is the source of the name: a farmer's coat caught fire after he left a pipe in his pocket! Tower Height: 050ft feet high. 1913 - erosion completey separated light from mainland, torn down. 1995 - replica built by community. This light is a replica.